It was a hit-and-miss summer, and whenever the sun looked like staying out for a while I jumped on my bike and headed out of Ipswich. Despite, or possibly because of, their proximity to my home, it had been several years since I'd explored the churches of the Shotley peninsula and its hinterland. Coming back, I was heartened to discover that all the churches I'd found open ten years before were all still open, and several of those which I'd found locked now listed keyholders. This was very pleasing, and I wondered what I would find at Bentley. Bentley is a fairly suburban village roughly halfway between Ipswich and Manningtree, but its church is off down a long, beautiful lane which heads in the general direction of Belstead and Wherstead. Not far off is Jimmy's Farm, made famous by television, and the huge housing estates of south-west Ipswich glower just over the horizon, but here the setting is intensely rural. About a mile from the village you reach a small outlying hamlet, the raggedy hedges giving way to the surprise of a neatly clipped churchyard and St Mary's crisp exterior. Despite the 14th century tower, this is essentially a 19th century building, largely the work of Richard Phipson, and very little older survives. What does, suggests that this was a Norman building, since some of the reset lancets are genuine. Not genuine, of course, is the grand mock-Norman south doorway, although it is done rather well, the chevrons and peacock eyes familiar from the surviving genuine articles around the county. The niche reset in the porch seems genuine too, or at least the canopy does. There's a nice modern image of Our Lady inside it. Until the 1960s, the Colchester to Hadleigh railway line ran along the edge of this graveyard, and this tower must have been a familiar landmark to travellers. Now, few people see it; but if, like me, you are enticed by such ghosts of the past, then you too will feel a frisson as you locate the route of the old line. And we know a little about the former life of this church, since Bentley was the seat of the Tollemaches before they established themselves at Helmingham. One of the vast Tollemache memorials there was originally in this church; when they got it to its new home, they found that it wouldn't fit, and had to build a little dormer window in the roof above it. Here, the churchyard feels ancient and peaceful, but I was impatient to try the door, because on two previous occasions I had found this church locked without a keyholder. St Mary was my twelfth church of the day, and the previous eleven had all been open, which I took as a good omen. I opened the porch door, and the first thing I saw was a notice announcing Welcome to St Mary's Church, Bentley. This was encouraging. Another notice on the other side read Welcome to St Mary's Church, Bentley, where Jesus is Lord, People are Loved, and Everyone is Welcome! It seemed that there had been a considerable change of heart, and so with mounting excitement I turned the door handle. Locked. I rattled it a few times, and tried putting my weight against it, but there was no doubt. I wasn't welcome after all, and when I turned back to look for a keyholder notice (there wasn't one), I saw that someone had scrawled on the first notice, the one that had bid me welcome, So why is the church locked? Very sad. Hmm. Well, it was frustrating, but no worse than I had found on previous visits. Since then, however, I had gained a new interest in 19th century glass, and the windows here appeared to be full of the stuff. It would have been interesting to see inside. However, the parish of Bentley appears not to value the chance to welcome passing strangers who might benefit from the sense of the numinous within. It has to be said that most medieval East Anglian churches are open every day: the Church of England, in these parts at least, appears to have come round to the idea that it is there for the benefit of everyone, including those who are not parishioners or even Anglicans, and that its churches should be open as places for peace, prayer and rest for all of us, and not just be posh, subsidised venues for weddings and the Sunday club. I wandered back down the graveyard path to my bike. I was just getting on, and wondering which direction to head in first, when I noticed another poster, on the board beside the gate. I walked over to read it, and what I read was so exasperating, so jaw-droppingly ironic that I quote it in full. YOUR CHURCH, YOUR HERITAGE, it began, in block capitals. It continued St Mary's Church, Bentley, needs the support of the community to survive for future generations of this village BE IT FOR Baptism, Marriage, Burial, Comfort, Friendship or Just to Pray. This beautiful old building dating back to Norman times needs your support to preserve it for the benefit of the community as a whole. Well, what can I say? There was no telephone number on the notice - if there had been, I would certainly have rung it. If I had come here for comfort, if I had come here to pray, I would have been seriously disappointed. Was the notice just lip-service? Or had I been unfortunate? When I got home, I e-mailed a few people who I knew had explored churches in this part of Suffolk recently. All of them had the same experience at Bentley. I cycled on, and as I did so I remembered what I had written about a church in Norfolk a couple of years previously, and which equally applied here. A locked church like Bentley is bad for all sorts of reasons. For a start, it means that the parish simply isn't doing its job. Christ's injunction for us to welcome the stranger within the gate is not fulfilled by a locked door. I wonder how a foreign visitor might feel, returning to the parish of his ancestors, hoping at least to see the War Memorial inside the church. I wondered if the parish has received any public money for the upkeep of their building? It should be a condition of all grant aid that the church is accessible to the public at reasonable times. It may well be that, despite the pessimism of the notice, Bentley is actually a thriving parish, and this church is packed to the gunwales three times every Sunday. Perhaps they actually don't need to be open as an act of witness to strangers, pilgrims and those with a thirst for a sense of the spiritual. Indeed, perhaps they have no room to welcome the tax collectors and sinners who might respond to the peace they'd find by wandering into this building on their own, on a weekday. But I suspect that this isn't so. 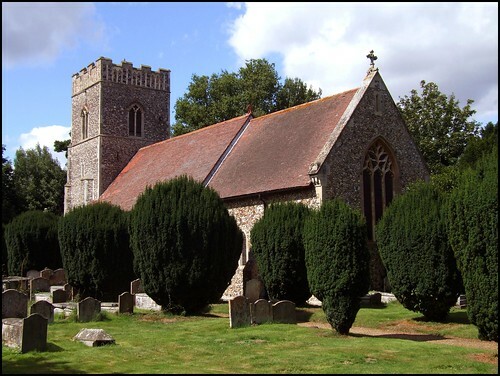 As I say, the great majority of Suffolk's medieval churches are open to visitors every day. The Church of England knows the power of an open church, knows that it is its greatest act of witness, and in any case works very hard in this Diocese ministering to all its people, Christians or not. But there are still pockets of Suffolk where the buildings are kept locked from one end of the week to the next, where the risk of Faith that an open door represents is not taken. Instead, such parishes open their churches only for the slightly smug activities of their club members, while the graveyard is left to the pagan cult of the dead, the bereaved worshipping their recent ancestors with propitiatory flowers, unable to combine this with a prayer said inside a sacred building, increasingly unaware even that this might be an appropriate thing to do.